For the books in chronological order click here. The point of this collection is not to provide a full summary or interpretation for each of the books of the New Testament. The underlying idea is simply that all 27 books of the New Testament were written in a living context. Something was happening in the church — very frequently a problem of some sort — and one of the apostles or someone representing an apostle produced a written document responding to that situation. It could be a stern letter of corrective, or it could be a personal note of encouragement. In some cases it was an entire recollection of the redemptive work of Christ (viz. the Gospels). Thus, our understanding of a particular book can be enhanced if we can reconstruct a Sitz-im-Leben or "life-situation” into which we can place the specific message of the human writer. E.g., most everyone knows that Paul wrote Galatians in response to the fact that some people were claiming that one could not be saved without first being circumcised. If, for some reason, someone missed out on that context, the book of Galatians would not make nearly as much sense to them as by knowing of its origin in this conflict in the church. Such considerations, which at times give us a good glimpse of the humanity of the inspired writer (e.g., see Gal. 5:12), do not in any way detract from the full inspiration and inerrancy of the text. For my attempt at a chronological sequence click here. Life Situation: As Judea was coming closer and closer to open warfare against Rome, some groups, e.g., the Pharisees and some of the Zealots, were claiming that the nation's troubles were at least partially due to the fact that not every Jew was keeping the law in all of its details. Already under Saul of Tarsus there had been some attempts at purifying the people, but now the question of who really belonged to the community became paramount. The issue centered around righteousness. The Pharisees were despising the Christians because they felt the Christians were sinful and did not live up to the righteous standards of the law. Response: Matthew attempted to help the Christians in this struggle by recalling to their minds how Jesus dealt with the Pharisees. He demonstrated that in part the Pharisees were right. The Christians are admittedly unrighteous sinners (as are all human beings)--but they are made righteous by God. The Church consists of "flawed" individuals under the leadership of Jesus who made them whole. Thus the reality of overt unrighteousness is there--but there is also forgiveness in Jesus Christ. 5 Special interest in children Back to Top! Life Situation: By now it had been more than twenty years after Christ's death and resurrection. A very small cooling-off period seemed to be setting in among Christians, particularly in view of the fact that Christ had not returned yet as he had promised (“delay of the parousia") Consequently some people were beginning to look away from Jesus Himself and towards the external structure of the Church, especially the leadership of the apostles and the preeminence of Jerusalem. a. Jesus Christ portrayed Himself as the One Who will return. b. His kingdom is one of repentance and belief, not an external one. c. The disciples were only human and had a long way to go themselves. d. Jerusalem has no inherent significance. e. Suffering until Christ returns is to be expected. b. The so-called "lost" ending. Back to Top! Life Situation: With the great spread of Christianity, it became more and more necessary to have an authoritative historical account of the life of Christ. This was especially important in the face of some rising docetism. As Christianity touched on many classes of people, an exhortation to meet the needs of the underprivileged in the church became necessary. Response: Luke pays special attention to the humility of Christ and His teachings on caring for the poor. 1 Historical compunction. 1:1-5; 2:1,2; 3:1,2. 2 Humility and humanity of Jesus. Ch. 2. 3 Interest in the poor, critique of the rich. 6:20ff; 12:15ff; 6:19ff. High appreciation of women. Special features of Luke: 1. Alliance with Acts. Luke 1:3/Acts 1:1. Back to Top! Life Situation: The close of the first century saw the rise of a great amount of philosophical speculation in the Mediterranean World. Many thinkers were coming up with views which attempted to escape from the present world into the realm of reason (logos--the rationality, order, logic reason). In their hand, "reason" actually became something that was ultimately beyond reason. It was esoteric and ineffable. Response: John counters these ideas with the clear message that the Word, Who is God, has come into the world as a man, and that belief in Him will provide eternal life. Thus we see that John is basically an apologetic gospel, written with non- Christians in mind, trying to display Christ to them so that they may come to believe in Him. The Deity of Christ. 1:1ff. Belief as the decisive criterion for receiving life. Eternal life as the goal of belief. Miracles as signs, demonstrating Christ's claims. Exclusive devotion to Judean ministry. Seven miracles followed by controversies. Large section on the Holy Spirit and His ministry. 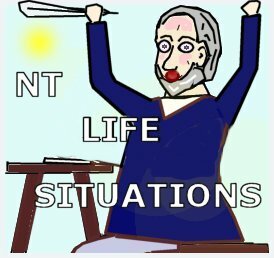 Life Situation: Acts is a second work by Luke, but it has its own theme and purposes. Many "we" passages show that Luke was an eye witness to a large number of the events recorded. Like the gospel of Luke, Acts speaks to the needs of a rapidly growing church. The apostolate of Paul presented a major problem. There were some detractors of Paul's ministry who rejected him for two reasons: 1. He was not one of the twelve original apostles. 2. His ministry was directed mostly toward the Gentiles. Response: Luke in Acts validates both Paul and his ministry. In order to argue against divisiveness in the church, Luke here emphasizes the fact that the church is everywhere directly traceable to Jesus Christ, His commission, and His apostles. Thus, as he describes the growth of the church, he makes it clear that this is the one and only Christian church. Luke may have had rival groups in mind which claimed equal validity with the church. Each new break-through of the gospel is accompanied by a special manifestation of the Holy Spirit. Important Note: Acts is a book which describes the church in a transitional period from Jesus' ministry to its final establishment. We must be careful to recognize that God may have worked in special ways at this time. In understanding any Bible passage, we must always use clear passages to understand the obscure; teaching portions of the Bible must shed light on narrative portions, not the other way around. Life Situation: Paul wrote this letter in preparation for a visit to that city as a stopover on his way to Spain. He had not founded the church here, thus we do not find here the same personal and emotional appeal as in some of the earlier letters. The church at Rome may have begun as a result of the visit of some Romans to Jerusalem; they were saved at Pentecost and then took the gospel with them back to Rome (cf. Acts 2:10).Paul was familiar with some of the people there, most prominently Priscilla and Aquila (16:3).We find no heresy which Paul tries to correct at Rome, but he does seem to address a particular problem. Apparently there was some friction between the Jews and the Gentiles in the church, perhaps each one claiming superiority over the other. Response: Paul's response is to show that God may have had separate plans in dealing with Jews and Gentiles, but that basically there is no difference in either the need for, the realization of, or the implications of salvation. There is no room for arrogance or pride for either group. 2. The human person is entrapped in evil matter, only the inner soul is good. 5. Superiority of those who have attained spiritual knowledge. To whatever extent the Corinthian Christians had become influenced by proto-Gnostic ideas, this gave rise to problems in the church: party strife, immorality, irreverence at the Lord's table, competition in the use of spiritual gifts, etc. Report of these problems came to Paul in Ephesus by way of some messenger from a man named Chloe (1:11). Paul immediately sent Timothy (4:17) with a letter preceding this one (“Corinthians A”), but this mission apparently was not helpful. 6. Women are not just one half of an androgynous ideal. Response: Paul's rejoinder consists of the admission of weakness, but the belief that this weakness is the key to God's power. He reminds the Corinthians that this weakness is responsible for their glory. However, on his next visit he will be harsh and exercise his God-given authority. Paul's expectation of the imminent return has become tempered with the possibility that he may die before Christ returns. 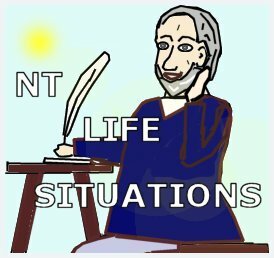 Life Situation: Because of Paul’s assertion that he had been in Jerusalem only twice before, these events must have occurred right at the end of Paul’s first missionary journey (Acts 14) before the meeting (the so-called “council”) of Jerusalem (Acts 15). The Christian community of Galatia had been invaded by a group of people advocating that Christians ought to submit to the Jewish ritual law, esp. circumcision. These people, the Judaizers may not even have been Jewish themselves. Their teaching seems to have been that salvation needs to be completed by circumcision, but once this act has been performed, it no longer matters how one lives. If the Judaizers like cutting themselves so much, they ought to just lop it off altogether. Life Situation: Prison epistle. Written by Paul from prison in Rome (ca. A.D. 59-61) Paul had spent three years in Ephesus. He had some very close friends there (cf. Acts 19, 20). Yet the letter lacks all personal references. 3:2 states an assumption by Paul that the readers will have heard of his ministry. How can this be? Apparently Ephesians was not addressed just to the church at Ephesus. It may have been a general circular letter directed to Ephesus. Paul does not seem to be making any effort to correct one particular problem peculiar to one Christian community. Response: Ephesians was clearly written to a group of established believers. Paul is writing from his imprisonment, reassessing the value of his ministry, reviewing his message, and encouraging the Christians to a deeper and more consistent life in Jesus Christ. The theme of the book is the unity of the church. This theme is developed in two sections: the disclosures of the mystery of the unity of Christ's church and body, and the practical outworking of this unity. Paul seems to include a defense of his ministry, but not in vehement terms. Life Situation: Like Romans and Ephesians, Philippians is not written as a polemical treatise against a certain heresy. Rather, it is a personal letter to the church at Philippi in which Paul displays some of his reflections, wisdom, and admonitions. He was probably closer to this church than to any other group. The church had sent Paul a financial gift, conveyed by Epaphras (Epaphroditus), who got seriously ill by the time he got to Rome. Response: Written from prison, Philippians is nonetheless an exuberant celebration of the gospel. Life Situation: Written at the same time as Ephesians; in fact, Colossians can be seen as a special application of the teaching of Ephesians. Col. 4:16 makes reference to a letter written to Laodicea. Could this letter to the Laodiceans be the one that we now know as Ephesians? In Colossae Gnosticism reappears under a slightly different form than we saw in Corinth. This variety emphasizes a series of intermediary beings (angels) spanning the gulf between the good God and evil matter, together making up the spiritual fullness (pleroma). Response: Paul responds that all fullness of God is found in Christ (1:19), and that he is directly responsible for creation. The heretics worship the angels. Paul points out that only Christ is worthy of worship. We are freed from legalism; therefore, the Gnostics' demand for disciplining of the body is useless. The last two “paranetic” (application) chapters describe how the new life in Christ manifests itself. Life Situation: Paul and Silas had visited Thessalonica ca. A.D. 50. They had to leave after establishment of a church there due to persecution. Paul eventually had to flee as far away as Athens. Now he was very concerned whether this new Christian community would hold up under the stress of suffering. Finally he could no longer bear the suspense and anxiety and sent Timothy to find out how things were in Thessalonica. Paul had already passed on to Corinth by the time that Timothy returned with a growing report of how well the church was standing up; their faith was a testimony in all of the surrounding communities. Now concerning the coming of our Lord Jesus Christ and our being gathered to Him: We ask you, brothers, 2 not to be easily upset in mind or troubled, either by a spirit or by a message or by a letter as if from us, alleging that the Day of the Lord has come. 3 Don’t let anyone deceive you in any way. For that day will not come unless the apostasy comes first and the man of lawlessness is revealed, the son of destruction. Life Situation: Written probably only a few weeks after the first letter. In 1 Thess. Paul emphasized the imminent return of Christ. This may have led to some misunderstanding. Now teachers have arisen who proclaim that the end is already here. Old values do not matter any longer, because this is the day of the Lord, so people can forego their regular obligations..
1. Christ will not come until after Anti-Christ has been revealed. 2. Believers ought to go on living normal upright lives. There is no room for people who refuse to do any work in view of the fact that the end is already here. 3. Implicitly Paul thereby also opposes any way of turning the Second Coming into a personal, spiritual event. Catch-phrases: Paul opposes "realized eschatology" as well as the heresy that is currently called "preterism." Life Situation: I Timothy is the first of the three pastoral epistles. Written to Timothy and Titus, Paul's close associates, these letters are very personal in tone and message. Paul is writing to instruct his understudies in times of crisis and personal need. There are numerous allusions to Paul's companions and his critical occasions in the pastoral epistles. These do not jive with the accounts in Acts, however. For this reason it is generally believed that Paul did not die at the end of Acts, but was released and enjoyed another brief period of ministry. Rather than moving west to Spain, as originally intended, he returned east and visited his churches once again. On one of these last trips, Paul came to Ephesus and encountered there a familiar problem: the infiltration of the church by false teachers. The false teaching was also familiar: Gnosticism (6:20, 4:4). Gnosticism here at Ephesus was like that at Colossae--combining speculations with legalism. He left Timothy, his companion, at Ephesus to rectify the situation. Paul moved on, but then wrote this letter to encourage Timothy and to instruct him. Response: Paul left Timothy, his companion, at Ephesus to rectify the situation. He moved on, but then wrote this letter to encourage Timothy and to instruct him. Since Paul was addressing Timothy and not a church, he gave no refutation of the heresy--none was needed--but instead he passed on instructions on how to handle it practically. Paul exhorted Timothy to preach the true Christian doctrine consistently and to ignore the false teachers. Since Timothy has been put in special charge of a church, there is a special emphasis on church order: 1) order in the worship service (chapter 2), 2) qualifications for office (chapter 3), social interactions in the church (chapter 5). Life Situation: Paul's swan-song. Once again Paul is in prison, this time without much hope of release. The reason (or pretext) for his arrest is not known. Apparently he is in Rome again. 1. To exhort Timothy to remain faithful in his ministry. 2. To encourage Timothy to come as soon as possible. Life Situation: As Paul had left Timothy in Ephesus, so he left Titus in Crete in order to straighten out a bad situation. In some respects the situation there was similar to the one in Ephesus. Again these were false teachers propounding pointless issues (though gnosticism is not clearly indicated). Again observance of the law is in question-but this time with the consensus that morality is irrelevant (cf. 1 Cor.). Response: Paul's response was to encourage Titus in teaching righteousness and sound doctrine. 9 I appeal to you, instead, on the basis of love. I, Paul, as an elderly man and now also as a prisoner of Christ Jesus, 10 appeal to you for my son, Onesimus. I fathered him while I was in chains. 11 Once he was useless to you, but now he is useful both to you and to me. 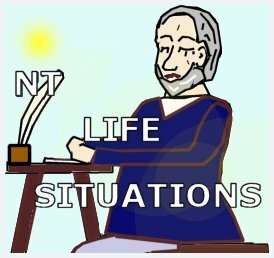 Life Situation: Philemon was a wealthy businessman in Colossae. He had a slave named Onesimus who stole money from his master and fled to Rome. There he came under Paul's influence and became a Christian. Now Paul sent Onesimus back to Philemon with the accompanying letter. Possibly, Onesimus carried Philippians, Ephesians, and Colossians with him. Response: Though this is a short and personal letter, some important points are made. Philemon presents a picture of God's forgiveness and the experience of this forgiveness in the Christian community. What was Paul's attitude toward slavery? Authorship The famous third century scholar, Origen, probably summed up best the whole question of the authorship of Hebrews when he said that "only God knows his name." Some of the leading candidates among those who try to speculate are Paul, Luke, Barnabas, and Apollos. The German scholar Adolf von Harnack proposed Priscilla, which is not without problems, but has the advantage of explaining why the name of the author was not attached to the book. 1. Opposition to the contemporary Jewish religious scene. 2. Looking for two messiahs--priest and king: priest is superior to the King. 3. Cessation and restoration of the sacrifices. 4. Importance of angels-- "Sons of God"
5. Dualism between the children of light and the children of darkness. It is possible to envision a group similar to this one to have come under the influence of Christianity, perhaps seeing Christ as a great prophet, perhaps as a messiah, but not giving him his proper place as Son of God and Savior. 2. Believers must move ahead with Christ. 3. The recipients must give up their practice of re-salvation because if one were to lose one’s salvation, there would be no other means than through Christ’s sacrifice. 4. Christ’s work as both priest and sacrifice has fulfilled the demands of the law, and thus, there is no further need of the Jewish temple cultus. Life Situation: There are several reasons to believe that this is a very early book, likely the earliest book of the New Testament. They may be fairly anemic, but there aren’t indications for a later time. c) One of the earliest problems that the church encountered was the provision for the widows (Acts 6:1), resembling the concern expressed by James. James, the brother of the Lord, did not become a believer until after the resurrection when Christ appeared to him. His special relationship as well as his disposition soon led him to a leadership position in Jerusalem, even overshadowing Peter and the Apostles. James was nicknamed "The Just": his lifestyle was extremely rigorous and blameless, and he looked for a similarly righteous life in all Christians. In the conflict over admission of the Gentiles to the church, James at first appeared to have sided with the legalists, but on the basis of Peter's testimony, he himself proposed the compromise which admitted Gentiles without circumcision, but with proper conduct. Response: The book of James reflects James' concern with the practical outworking of Christianity in a righteous life-style. There is almost no theology here, but much admonition and exhortation. The recipients of the letter were Jews, possibly some unbelievers. James warns the new believers that faith devoid of good works is useless; he gives specific instruction on how to build up the Christian community. Life Situation: The sixties saw the removal of Roman legitimization of Christianity, and the rise of persecution. Even if the persecutions during those early times were relatively small and localized, the idea that being a Christian was becoming a crime in and of itself would have sent shock waves through the churches. 1. A description of the preciousness of the gospel. 2. An exhortation to persevere in the light of the gospel. Perseverance here, as with Paul in I Thessalonians, implies leading an irreproachable life. Life Situation: Peter's second letter has no known addressees; it appears that it was written to all Christians in general. The theme, to hold fast, is the same as in I Peter, but the circumstances are different; Peter is now concerned with false teachers—once again a contingent of Gnostics. Response: The letter can conveniently be divided into 3 parts, each corresponding to one chapter. 1. Evidence of and for true knowledge of God. 2. The evil of false teachers (cf. Jude). 3. The delay of the second coming as a mark of God's grace. Life Situation: No claim to authorship by name is made in these letters, but tradition has it that the author was the apostle, John. Even those who want to deny this tradition are forced to admit that the author must have been in the so-called Johanine school of thought. (In other words, someone just like him with the same name.) Tradition also places John in Ephesus after the deaths of Peter and Paul. Here in Ephesus John was combating the dualistic teaching of a man named Cerinthus. Cerinthianism held that Jesus the man did not become the Christ, i.e. the Son of God, until the Holy Spirit came on him at his baptism. Then the spirit of God left him again right before the crucifixion. Apparently by now some churches had split over the issue (2:19), whereas in others the controversy still raged. In addition to this “docetic” Christology, the followers of Cerinthus were claiming to be intrinsically sinless and could, therefore, do whatever they wanted with their physical bodies. II & III John dealt with a well-known phenomenon of the early church- the traveling teachers or preachers. Because of the abundance of heretical teachings, there had to be rules concerning whom to accommodate and whom not to welcome. 2) anyone who does not acknowledge that Jesus is the Christ (i.e. the total incarnation) could possibly belong to him. In II John warned a congregation not to receive false teachers; in III John, he chastised a church autocrat who refused to welcome teachers of the true doctrine. Life Situation and Response: Jude, identifying himself as a brother of James, would also be a brother of the Lord Jesus. He seems to share James' stern temperament. Jude originally had planned to write merely "of our common salvation", but then something changed his mind - it became necessary for him to write instead in opposition to a group of false teachers. These false teachers are characterized by antinomianism and total irreverence. An interesting problem is presented by the relationship of II Peter 2 and Jude. The similarities are too stark to be coincidental. Which one relied on whom? There are many opinions as to what may have happened. We may take vs. 17 & 18 as a reference to II Peter. In that case, Jude is an extension of II Peter, describing how what was predicted many years earlier had now come to pass (though it was already current in Peter's time). Life Situation: Persecutions by the Romans against the Christians were increasing in severity. Revelation was written by the apostle John who was in exile on the rocky island of Patmos. There is no question that the book reeals a situation in which Christians were longing to be feed from oppression. Response: The book reflects the attitude of the church during the beginning of systematic persecution, ca. 65 A.D. It describes the glorious triumph of the Lord Jesus Christ over all hostile world powers. Interpretations of Revelation vary.